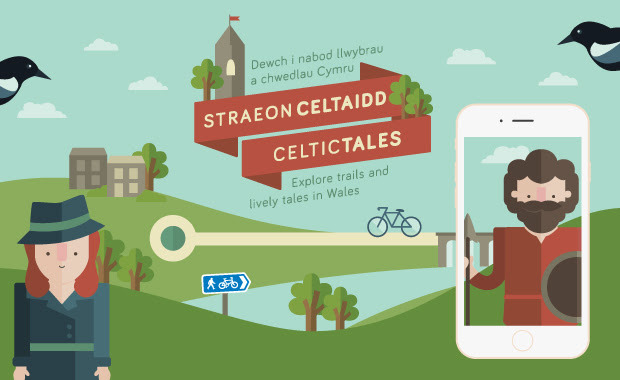 PlayARK and Yellow Brick are pleased to announce the launch of Celtic Tales, a storytelling app they have produced for Sustrans. You can explore a history or a mystery story along six beautiful cycle routes in North and South Wales, so chances are there is one local to you! You might meet Maxine Hardy a private investigator who is asked to solve the most mysterious crimes all over the country or you could be in the company of a Roman soldier or a Norman bowman while he goes about buy generic viagra his duties. If you’re looking for something to do on the few dry days we have left, Celtic Tales is the perfect excuse to get out there on your bike or pull those walking boots out of the cupboard. The app offers great activities for families to explore the great outdoors or fun stories to share with your friends or even enjoy on a solo journey. Hoffi have built the app around a GPS tracking system so that you are provided with new content at each stop along your route and our brilliant illustrator Flavia Mayor has brought the characters and trails to life with beautiful artwork. We hope you have as much fun exploring as we have had and please let us know how you get on! So what are you waiting for?